The Week of Prayer for Christian Unity 2019 theme has been selected, and finds its origins in Deuteronomy. “Justice, Only Justice, You Shall Pursue” (cf. Deuteronomy 16:20) was chosen for its powerful message of promoting truth, equality and unity. The initial work on the theme for this year’s Week of Prayer was prepared by a group of representatives from different parts of Indonesia, including the Communion of Churches in Indonesia and the Indonesian Catholic Bishops’ Conference. The texts were finalized during a meeting of the International Committee of the Faith and Order Commission of the World Council of Churches and the Pontifical Council for Promoting Christian Unity. The Christians of Indonesia found that the words of Deuteronomy, “Justice, and only justice, you shall pursue …” (cf. Deuteronomy 16:18-20) spoke powerfully to their situation and needs, and recognized this common need throughout the world. The resource materials for the annual celebration of the Week of Prayer for Christian Unity are prepared by the Franciscan Friars of the Atonement ministry, Graymoor Ecumenical and Interreligious Institute (GEII). When available, items may be purchased at their secure website GEII.org. The Week of Prayer for Christian Unity is celebrated in the Northern Hemisphere from January 18-25 each year. The traditional period in the northern hemisphere for the Week of Prayer for Christian Unity is January 18 to 25. Those dates were proposed in 1908 by Servant of God, Fr. Paul Wattson, Founder of the Society of the Atonement, to cover the original days of the Feasts of the Chair of St. Peter (January 18) and the Conversion of St. Paul (January 25), and therefore have a symbolic significance. 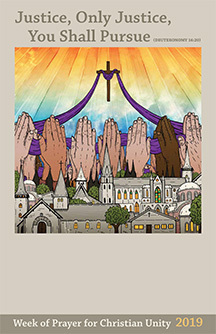 Materials for the celebration of the Week of Prayer For Christian Unity 2019 will be available from the Graymoor Ecumenical and Interreligious Institute by following the link below.